← Do You Like To Pin On Pininterest? My maid’s on holiday for a month and I am sick for 3 weeks. Perfect timing, just perfect! Sick or not, the housework and cooking had to be done. Boo Hoo. I realize a few things from her absence. I’ve gone full circle from working to a housewife to a so called lady of leisure with a maid and back to housewife. Every one of this stage has its pros and cons. I’m not afraid of housework and am fully capable of handling my house (although the man thinks the maid is more capable than me) but that was only because I was sick. Heheh. It is not possible to guide the kids with schoolwork, do housework and work all at the same time. Kudos off to any supermom who can multitask and do all of it. I can’t. Well, I need to go off now to iron and cook. So, see you next time. The maid made me these before she left for her holidays. 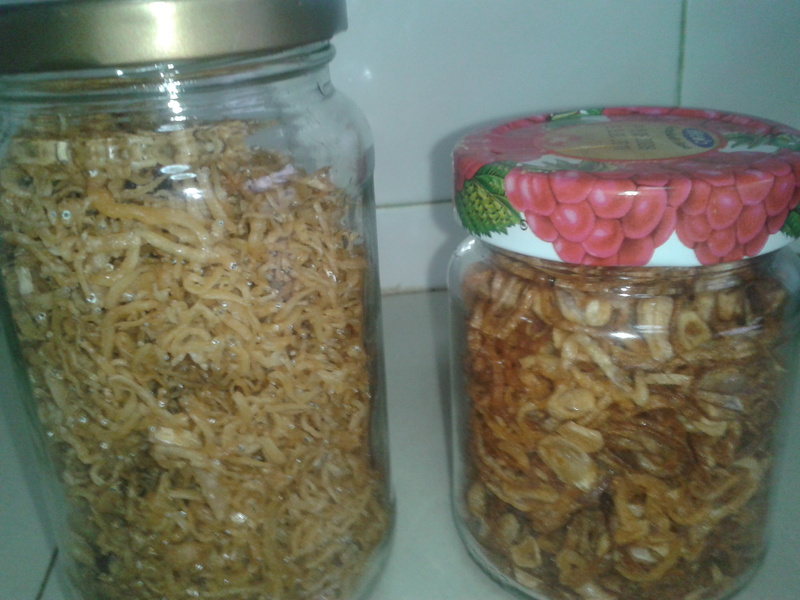 Fried Ikan Bilis and Fried Shallots to flavour my food. Lovely! Even instant noodles tastes better when cooked by his wife. TRUE that! haha.. So true to #5. That’s why on and off I get cuckoo and depress. So much I want to do, so little flexibility I have. And yet there are people telling me it is all about time management. I like no.4 – same here. And no.5 is definitely true. There is limited physical and mental capacity in a person, including women, esp ‘mothers’. So, every help is most welcome. LOL!!! we had the same too, when Kakak went back for holiday last year. In addition to that, I even asked her to pound spice for my chicken and meat and I freeze them up.